THROUGHOUT 2018, voices from across the finance and banking industry called for top-down reform. Some of those voices were heard by Commissioner Hayne himself; others echoed throughout the media. One voice was that of Finance Sector Union (FSU) national secretary Julia Angrisano, who wants to see the implementation of higher levels of professionalism, an industry-wide professional and ethical framework, and an industryled professionalisation program. Ultimately, she has a vision “to make banking great again” – and brokers can play a pivotal role in achieving that. In a statement released in November, Angrisano said, “A process of professionalisation should not be limited to financial advisers. Explaining the idea to Australian Broker, she says, “A professional and ethical framework is required across the whole sector. This framework needs to be developed in a way that supports and rewards all workers for delivering the best service to customers and the community. To support this, Angrisano has also called for a new financial services code to be established to centralise the obligations that currently exist under “a variety of laws, regulator advices and self-regulatory instruments, such as the Banking Code of Practice”. “A key defect in the current system is that there are simply too many organisations and regulations in play. A complicated regulatory system doesn’t deliver for customers,” she says. With 20 years’ industry experience, Angrisano sees the existing regulatory environment as “cumbersome and superfluous” for employees and so complicated that it also fails to meet the needs of customers. Since first being elected in 2016, she has repeatedly called for cultural and regulatory changes to be made throughout the finance industry, and under her leadership the FSU has made submissions to the Sedgwick Retail Banking Remuneration Review; the royal commission; the Treasury review into ASIC’s power to ban senior sector officials; and the Treasury’s consultation paper on the Banking Executive Accountability Regime, among others. “Regulation is important but it cannot continue to be done in a piecemeal fashion without understanding the ongoing impacts. 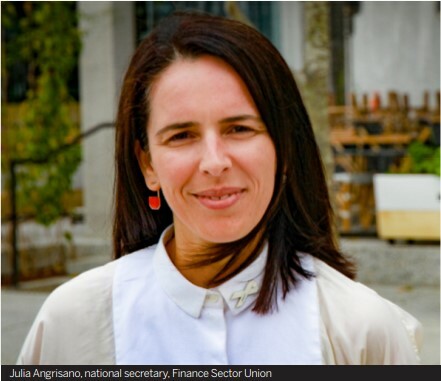 A financial services code should also imbed an obligation to act ethically, with due skill and care, and ensure that financial products that are provided are fit for purpose,” Angrisano says. What the coming weeks will bring is anybody’s guess – these measures could become central to the regulations that emerge as a result of Commissioner Hayne’s final report. But Angrisano believes it’s how the recommendations are executed that will be the real test. “Whether or not the investigations have been sufficient will only be seen firstly through Commissioner Hayne’s final report, and secondly, in how his recommendations are implemented,” she says. However, for Angrisano and the FSU, the commission has left many stones unturned. “From the moment the royal commission was announced we were sceptical that the terms of reference and the time and resources given would genuinely get to some of the institutional and system-wide problems that are endemic across the industry,” she says. While she commends Hayne’s work in highlighting “some of the bigger issues” that have previously been overlooked – including conflicts in remuneration, regulator obligations and the impact of culture – in other areas it leaves much to be desired. She says, “Should the terms of reference have been broader? Possibly.